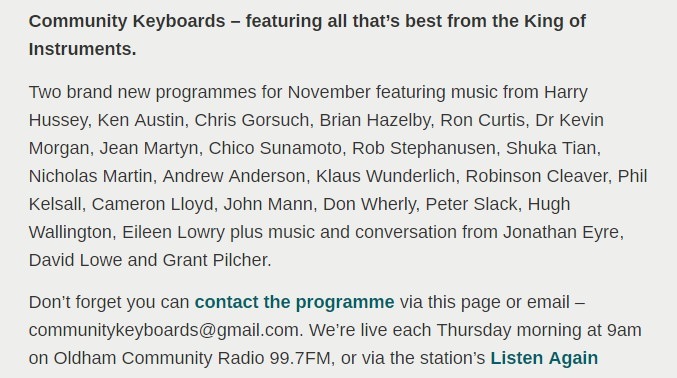 As you may know I produce/present “Community Keyboards”, Oldham Community Radio 99.7FM. I wonder if I might be able to include the winning entry to the August (and future) challenge in one of my forthcoming editions of the programme? If this is something which could be considered, all I would need would be the consent of the performer and perhaps a short biography to introduce. Would be great to have your thoughts. If you click on the LISTEN page you will find Ian's 'Keyboard Music' (mostly organs) to listen to. Also, if you scroll down you will see that Ian has put a LINK to the Tierce-de-Picardie Forum (bottom left). Well, I must say how delighted I am to be able to include the winning entry or, in the case of the August Challenge, entries, on my Community Keyboards programme. As is so often the case, being a recorded programme, we have to work at least a month in advance, so this means that - and here we go with dates for the diary - the August winners will be featured in the second of our two November editions which will be broadcast on Oldham Community Radio 99.7FM on Thursday 8th November at 9.02am and repeated Thursday 22nd November at 9.02am. Being a community radio station, our FM signal reaches across much of the Greater Manchester/Cheshire region - but that it!! 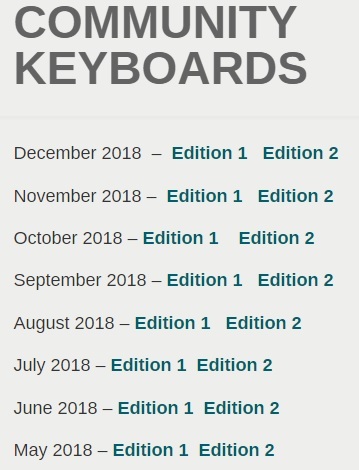 The good news for everyone else is that the two November editions are uploaded to http://www.communitykeyboards.com a little ahead of that - on Sunday 28th October around 7pm. Hope you enjoy the programme! Obviously we can't listen to the actual Radio Broadcast as we are not in the Oldham/Manchester/Cheshire area. Hence the Website Ian has set up above .. so that anyone anywhere can listen to his broadcasts. Both Prog 1 and Prog 2 run for nearly an hour and feature mainly 'TheatreOrganists'. Ian interviews a few of them. These are the organists he is featuring .. and notice the list includes Don Wherly, Peter Slack, Hugh Wallington and Eileen Lowry. When will you be putting up your next 'on-line' broadcast of your Community Radio? Now that we know where you are, several Members have listened to ALL your broadcasts going all the way back to when you started them. They have said that they enjoy your program more than they used to enjoy 'The Organist Entertains' (of course, now no longer being broadcast) as you have those interviews with Artistes, which are brilliant! And you cater for Electronic Organs too, which The Organist Entertains had stopped doing. They are hooked on your program! Hope all is well and very many thanks for your kind email. The next two editions of Community Keyboards will be uploaded to the website this Sunday evening (25/11/2018). These will be the “Christmas” shows (as you may expect!) and will include the September Challenge winners. It’s lovely to hear that some forum members are enjoying the programme too. I do try to provide a mix of all organ and keyboard genres but to receive these comments is very encouraging indeed. I’ve downloaded the October winners which will slot into the February editions. Thanks again and all good wishes. Ian Wolstenholme, who runs Oldham Community Radio, has included the 'Winners' of the September Challenge in his December Broadcast. Charles Hughes with Trumpeter's Lullaby. Click the below to go to the page where you can find his broadcast (do a right-click to open it up in a New Tab). The TDP bit starts at 45:30 on December 2018 - Edition 2. Both Editions are from the Oktoberfest held in Huntingdon recently, so no TDP 'Winners' in this one. Thanks for keeping us up to date on what`s happening on this front. I'm a bit behind with my updates for Oldham Community Radio. They are broadcasting the 'Winner/s of our Music Challenge. Click this LINK to go to their on-line version of the Radio Program. The Winners of the October Challenge are featured in both Editions of their February broadcast. Brian Dawson (Brian007) at 1:07 with Till There Was You. Don Wherly (DonW) with Music Of The Night at 32:10. Hugh Wallington (Hugh-AR) at 15:25 with Climb Every Mountain. The Winners of the December Challenge are featured in their March broadcast. Tony Kettridge (Ajay) at 45:20 with Caravan. Hugh Wallington (Hugh-AR) at 49:04 with a Quickstep Medley. The APRIL editions of Community Keyboards are up now - I guess that's what Hugh meant, as I listened to the March edition a couple of weeks back. Just a quick update - the April 2nd edition will be available shortly - I just need to get final approval from the organisers of the ATOS YTOY competition. Apologies for this.